More than anything she’s ever wanted, Martha wants to play the cello. But even music becomes dangerous to her health–because nothing is what it seems in this place. With her mother’s willpower dissolving, Martha watches helplessly as her own dreams slip further away. I have very mixed feelings about this book. It was only after finishing it that I realized that it is supposed to be a YA novel, which surprised me a bit considering some of the material. But the protagonist’s voice is definitely that of a 14-year-old which, now that I am almost a decade removed from that age (wow, that makes me feel old), might as well be a foreign language. While I sympathized with Martha in some parts, I mostly found her to be incredibly petulant, especially while she was living with the Brinkmans. Yes, her situation was horrible, but I felt that a lot of her misfortune was her own fault. I realize expecting teenagers to be rational is completely irrational, but how could she not learn her lesson after seeing the outcome the first, second, fifteenth time? After all, you can’t keep poking a sleeping bear and expect it not to attack, and apparently that is something that our protagonist simply doesn’t understand. That said, I really have to disagree with the last line of the summary. This book is neither unforgettable, smart, poignant, nor very real. While the themes — child abuse, alcoholism, racism — are real, the book itself doesn’t feel realistic. The ending felt rushed and is incredibly ambiguous — good in some cases, but not in this one — and the characters don’t have any real depth. Richard Brinkman takes Martha in because she reminds him of his deceased daughter? Chardonnay bullies Martha simply because she’s white? Nikki hates Martha because she’s jealous that her father took her in? Are these people really that shallow? I really did want to like this book. The premise sounded really interesting and the sample I read before buying it hooked me. But the more I read, the more bored and frustrated I got. For Martha to be such a smart girl, she repeatedly made really stupid choices. Ultimately, I doubt I will remember this book months from now but, if I do, it will be with disappointment for the loss of potential that made me want to read it in the first place. 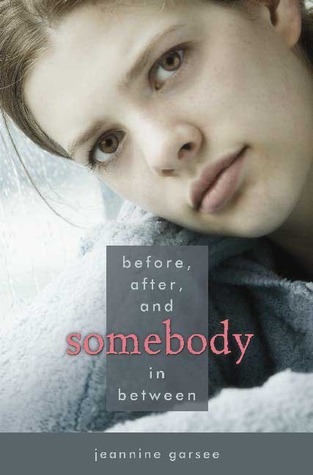 Tagged alcoholism, before after and somebody in between, child abuse, jeannine garsee, racism.